The beginning of your journey is not the time to sort the challenging items. Set yourself up for success and declutter the meaningless junk first. Sentimental items are overwhelming, and it’s easy to feel that these things will never get sorted, which is why I always recommend you save them for last. Give yourself plenty of decluttering victories before having the hard things. But, if you are ready to work through the deeper levels of clutter, than roll up your sleeves, set a determined look on your face and let’s dig in. 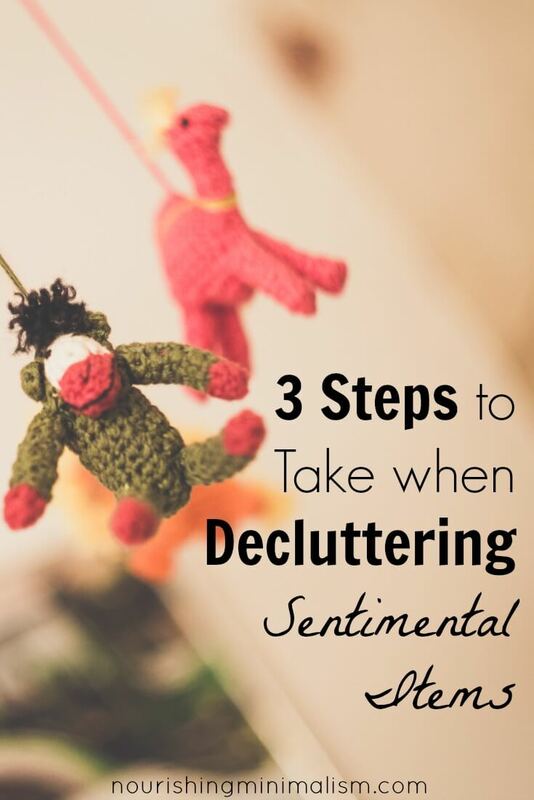 When you are decluttering sentimental items, you have to recognize that different feelings and emotions are going to come up. This is normal and healthy. Sure, feelings can be uncomfortable, because we often spend our lives avoiding them and avoiding causing other people to feel things (“I have to keep that teapot Aunt Linda gave me, so I don’t hurt her feelings”). Addressing those feelings is one of the major benefits of embracing a simpler life. It’s not just the physical clutter that adds stress; it’s the heavy emotions behind the items and the postponed decisions that weight us down. When you take time to feel and acknowledge those feelings, you can work through the emotions and let the item and the weighty emotions go, bringing some calm and peace into your life. When we refuse to feel the emotions we have, we live impaired lives, missing out on various gifts that are available for all of us. Though it may be uncomfortable at times, paying attention to your feelings is a must if you want to declutter those sentimental items. 1. Feel your feelings – take responsibility for what your heart is saying. 2. Talk about it; whether this is with someone you trust, or in a journal, it’s important to express your feelings. 3. Admit your need. We all need, it’s human. We cannot be perfect, complete and whole in and of ourselves. This may be admitting you need to cry, acknowledging you need the person you lost, admitting you feel broken or admitting that this life isn’t perfect. The steps may be easy for me to write, but I’ll be honest: they are not easy steps to take. But, if you allow yourself to work through that process, you open yourself up to healing and fulfillment in your life. Embracing minimalism doesn’t mean you are going to get rid of every single thing. It means you are going to eliminate the excess. The things the prevent you from living the life you want to be living. For a few people, this will be getting rid of all sentimental items so they can live out of their backpack. But for the majority of people, it means recognizing the pieces that are special and giving them a place of honor in your home. Keep the number of items you feel comfortable with. Do you have a painting from your grandmother that you love? Keep it. A dining room set that you don’t? Let it go. Permitting yourself to keep the special items before you begin will help curb the anxiety of decluttering these items. You can face it, knowing that you are simply editing out the things that don’t serve you but keeping the things that do serve you. Why do we struggle to let go of items from people who have passed away? We all have an innate desire for this life to be whole, complete and perfect. It’s not, and we can’t make it that way, but we all have a desire for it. Part of the struggle is admitting that there is an end to every season, and when we lose a loved one, facing the end to that season is one of the hardest things we have to face. We long for things to be right, well, good and continue as such. The more we value something, the deeper our sorrow, but that isn’t all bad. Sadness is an honoring emotion. When you allow yourself to feel sad, you honor what was lost and move towards accepting things, that feels wholly unacceptable. When we refuse to feel that sadness, we transfer our emotions from the person we lost to their old possessions. We try to keep them alive, embodied in their old stuff because we are unwilling to let them go. Then, when we decide to get rid of the items, it feels as if we are losing them all over again, we can’t possibly go through that again, and we become enslaved to the emotions we don’t want to face. If we grieve genuinely, we eventually come to accept life in these imperfect terms. It doesn’t matter how long it has been, or if you think “that’s water under the bridge.” You have to feel those feelings before you can move on and find healing. 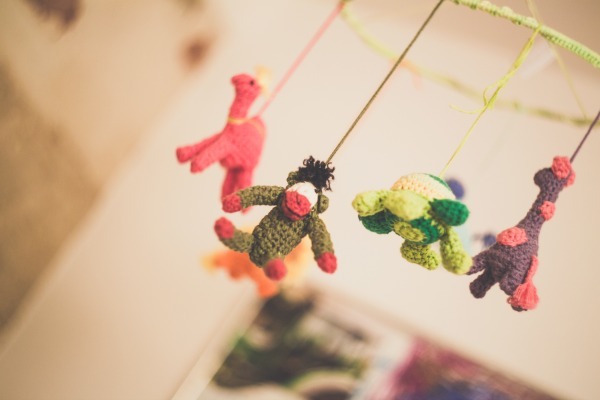 It is similar in all the sentimental things we have to sort, whether they are drawings the children made, baby clothes, or college textbooks and notes. When you let go of baby clothes, it is admitting that that season of life is past. When we hold the clothes, we remember how little they were, all the hopes and dreams we had, and how life isn’t quite what we imagined it would be now. None of those feelings are wrong. And to move on, you have to feel them. Allow yourself to be sad, allow yourself to admit if things aren’t like you dreamed they would be. It’s part of the process, and in doing so, you allow yourself to accept the past and live more fully in the present. We have an incredible ability to remember the good things. When we think back to when our babies were small, we think of the fuzzy head resting under our chin, we think of the little eyes that lite up when they saw us and the little arms that came running to mama whenever there was doubt. Those are precious memories. But if you are holding onto the clothes, the toys and all the various whatnots that come with little humans, because you can’t bear to be out of that season you aren’t fully able to appreciate the season you are in now. No matter what season you are in, there is joy to be found. Holding onto the past makes the present joy much more difficult to see and embrace. This is a very timely article as I am in the process of downsizing from a five bedroom house to a two bedroom house. All the kids have moved out and there is a lot of sentiment around here. It’s not going to be easy. But it needs to be done. Oh gosh! I’m finally reading this after bookmarking it to read. It is so timely for me! But, ugh, as I get ready to move, I’m not happy with myself. I just finished the Kon Mari process after a year of work, except photos. I thought I had purged so many things, until I saw my neatly boxed up sentimental stuff all in a row in my basement. It’s entirely way more than I ever wanted to keep! Oh man. So, as I was doing my Kon Mari process, I also got hit with my late mom’s stuff and she never sorted my late grandparents’ stuff. Fun times! I had to sort theirs, mine, and also, on top of that, heal adrenal fatigue and some other things like anemia. I had the bonus of having to deal with rehashing the grief over losing my grandparents in 2001 and 2004. Argh! So, my inner child was hurting a bit when I got down to my own sentimental stuff. I am thinking of keeping it for a year and then, re-evaluating it all. I might just take photos. I did let go of some, but part of me feels by moving back to my college town, I’ll be able to reclaim myself and my heart and feel more peaceful about letting go of the stuff that weighs me down! At times, I feel like a big failure. The wild thing is, I didn’t really want to keep much of my mom’s or her parents’ stuff. I was more into photographs. I just feel so many layers of guilt about getting rid of some of the dead folks’ things and well, at times, I wonder if I will erase my life history by letting go of most of my childhood items and stuff from high school, college, and young adulthood. Yet at 45, I know that I don’t want others to have to deal with my stuff after I pass, after having sorted through dead folks’ things. I feel alone at times in my journey and your site and Facebook group have helped me. I went to 6 funerals in 2015, including my mom’s. It made me re-evaluate what’s really important. Yet, duh, why am I keeping “ridiculous” things from my childhood. I do have a counselor and she says to let it go when I’m ready. Ha! I wish! LOL! Thanks for letting me be longwinded…apologies! I need help getting rid of my kids baby clothes and toys,and I can’t. It makes me feel very sad,I cry and I am very upset. I keep important items in the storage box and label them. I am so thankful I found this article. Sometimes I stayed at work later than I had to because I could not stand coming home to the clutter and frustration of dealing with it. I would end up buying things I already had because I didn’t have the energy to search for nor could I find many of my possessions. They were buried in piles and tubs in the basement in closets etc. As I got older it became harder and harder to stay on top of my clutter which led to feelings of anxiety and depression and a sense of being stuck. Every day off and holiday was spent trying to manage my stuff. After reading this article and the links I am going to be clearing out bags and bags of stuff and free my mind. I’m tired of living like this. I am a “sentimental fool” and find it very difficult passing things along. My “baby” is now 15 years old, what helped me, was finally coming to the realization that helping others, like unwed mothers or someone who may otherwise have difficulty affording clothes (or other items) for her child makes me feel very wonderful. Knowing that they will be used for someone’s sweet little angel brings me much joy and makes it easier to let go. Two of my three daughters have turned minimalist. I see good in that as well as harm. The oldest daughter even gets rid of her older children’s belongings which isn’t good. My daughter and I are close, but she has given away all but one, possibly two keepsakes that I have ever given her. I don’t ever plan to give her any more. It has gotten so bad that she doesn’t even have a silverware divider in her drawer. All of the cutlery is willy nilly everywhere and you touch the knife blades and all when reaching in for a spoon etc. We no longer exchange gifts except for essential oils that I give for birthdays. I agree that minimalism is a good thing (I am down-sizing, too) but I also think it can be like anorexia…It’s something that you CAN control. When she gets stressed, she goes and finds things to get rid of… Believe me, there is nothing left for her to get rid of!